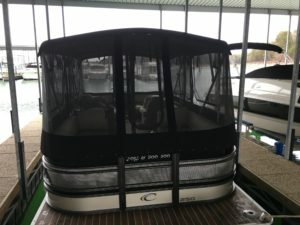 Concord Custom Canvas offers pontoon boat enclosures to pontoon boat owners looking to get the most out of their boat. These enclosures are great for staying warm during those cool nights. In the summer, the bimini keeps the sun at bay and screens on the enclosure keep the bugs out. There are many features on these enclosures that can be tailored to make it perfect for any boat. 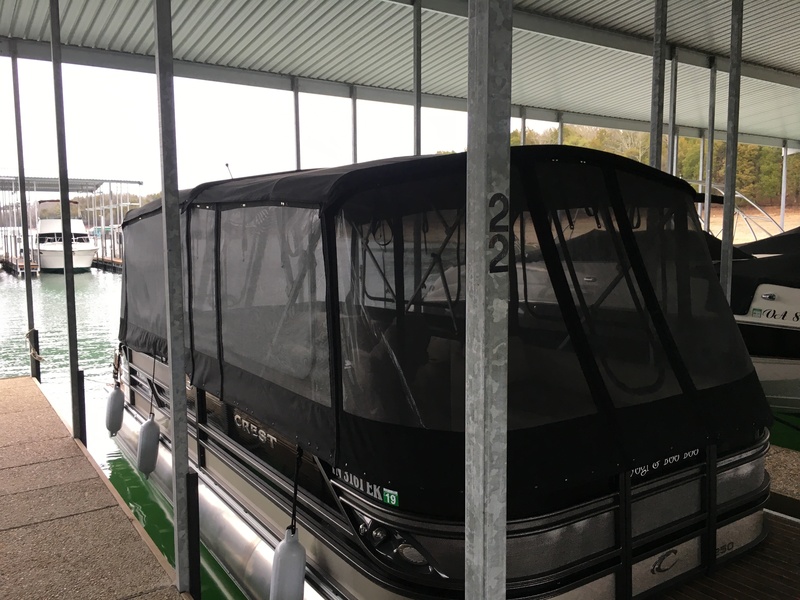 Please contact us today to discuss your pontoon boat enclosure project. The boat in these images had a full bimini (4-bow) and a two bow frame (forward). The forward bimini extends from a flap under the main bimini to the forward bows. All main bows had full length pockets around them with snaps in the bend. All mid-bows have 3-ft pockets supporting them. Port Side view of a pontoon boat enclosure. View of the bow of a pontoon boat with a full enclosure. 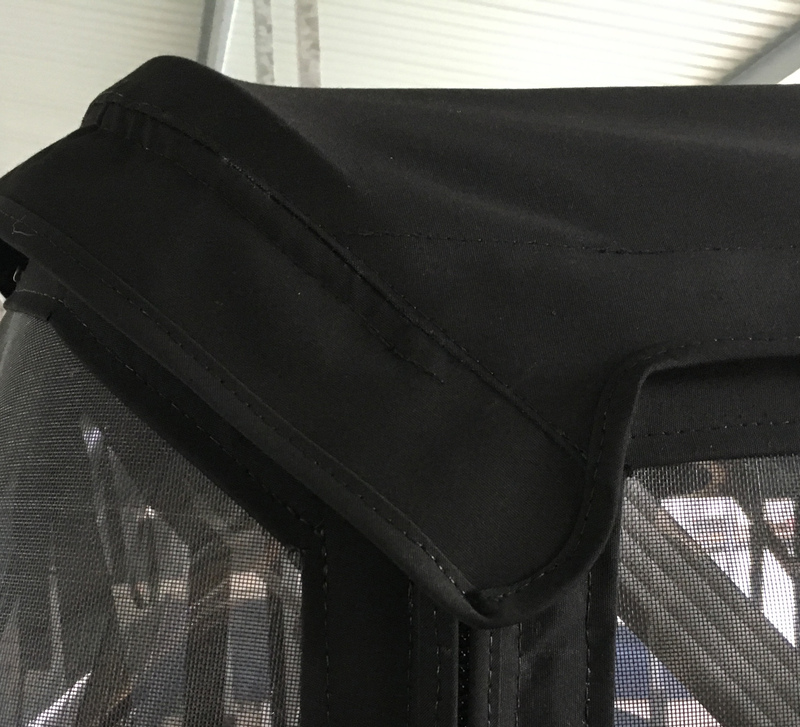 Each side panel and the forward bimini detach from each other by way of zippers. The foot of all side, front and aft panels are held in place with snaps. Closeup of the zipper attachment on the underside of the forward bimini. 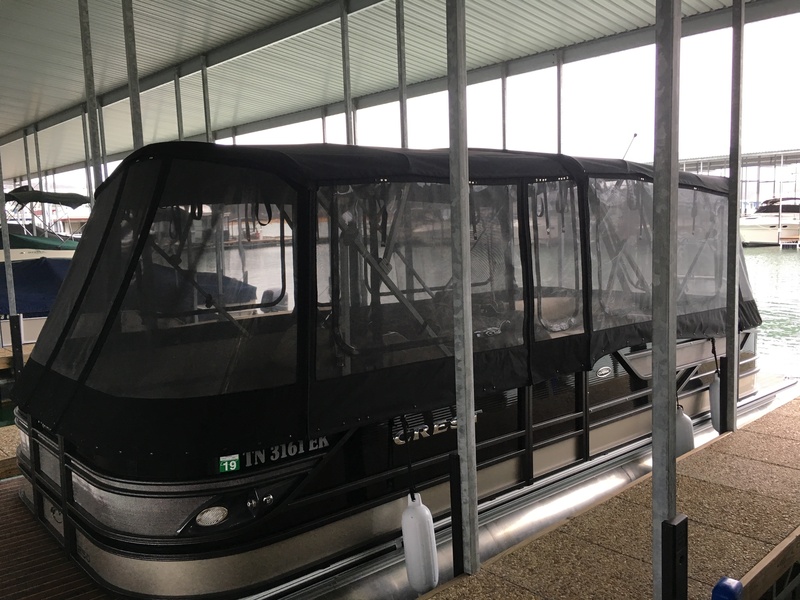 This pontoon enclosure features screen on all panels. 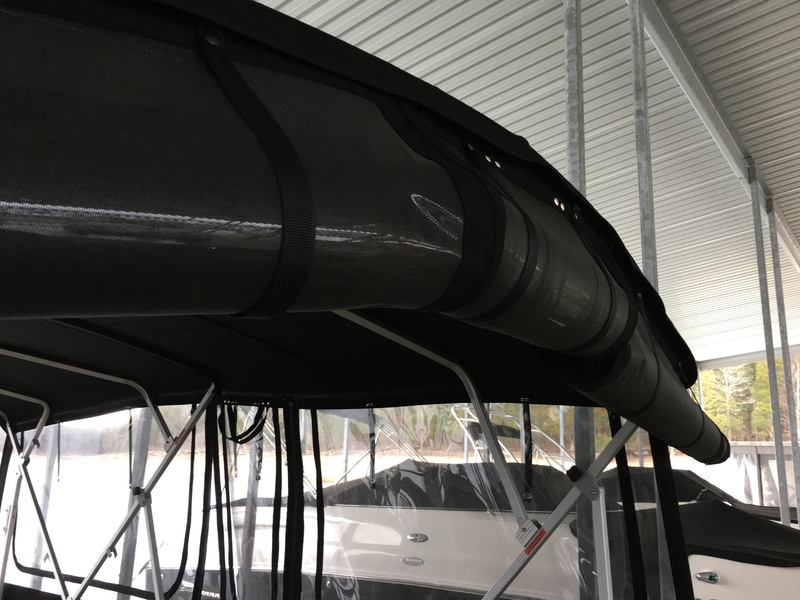 Most panels contain smile zippers that can roll-up to open the boat up. Screens keep any insects out. Furthermore, panels roll up to completely open the boat up for maximum ventilation on those hot days and nights. 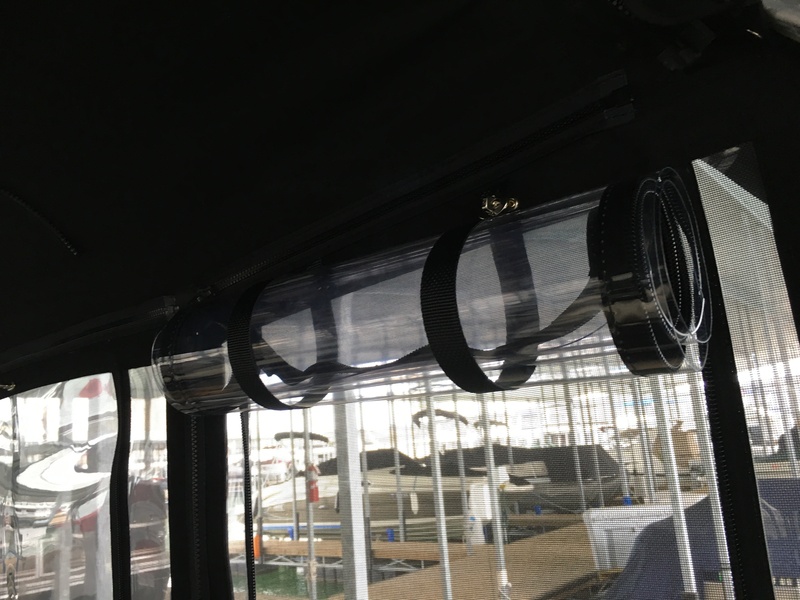 Rolled up front windows on a pontoon boat enclosure. Rolled up smile window on a pontoon boat enclosure. Keeping out the water is an important objective for any boat cover. Pontoon boat enclosures are no exception. 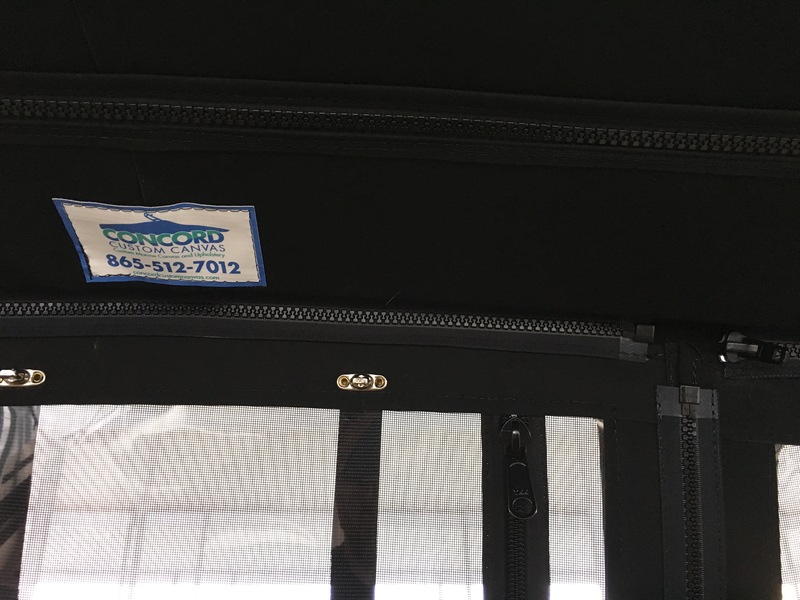 Concord Custom Canvas designs and constructs its enclosures with a mind toward keeping out the water. Note the flap in the following image is designed to cover the intersection of several panels. This is a common place to have water intrude. With this design water is kept out of the boat. Detail of the Flap on a Pontoon Boat Enclosure. 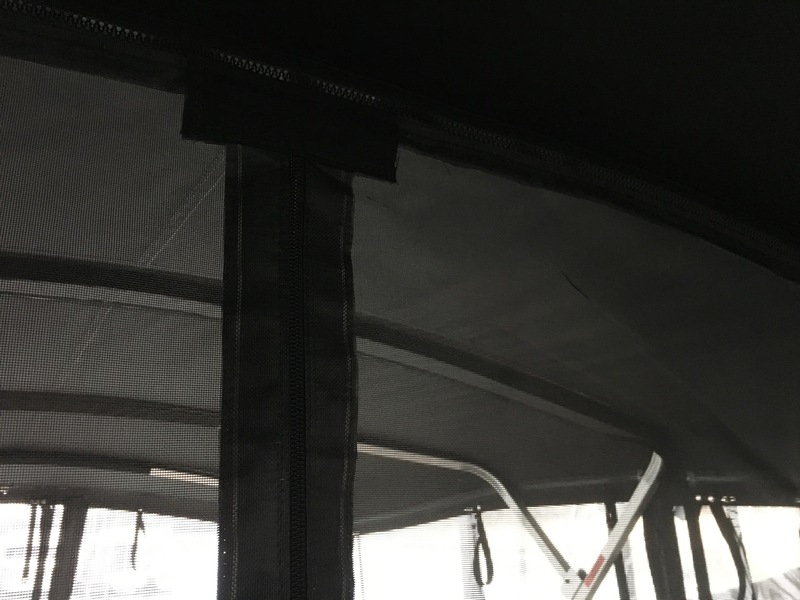 Though a bit hard to see in the images, this pontoon enclosure also had a bug screen held onto the front bimini by a zipper. 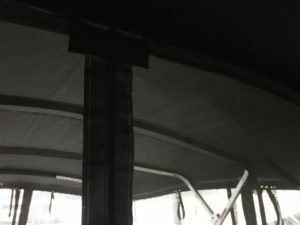 The screen drapes all the way to the deck of the boat to keep the bugs out of the back of the boat. 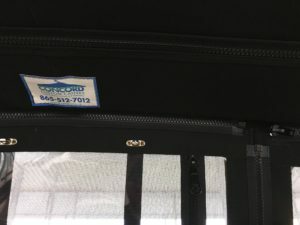 A zipper in the middle of the screen is used as a doorway.